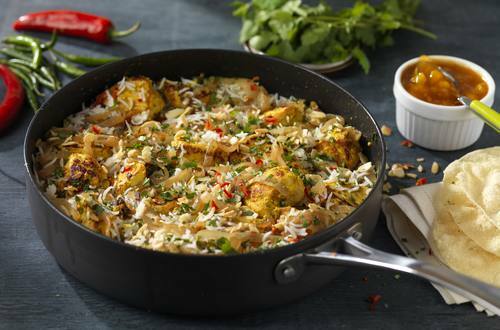 1 In a large bowl, mix the chicken with the Knorr Chicken Stock Pot, chopped garlic, chilli, ginger, lemon juice, cardamom pods, turmeric, garam masala and natural yoghurt. Set aside to marinate for 20-30 minutes. 2 Heat the vegetable oil in a large frying pan. Add the onions and cook on a medium heat for 6-8 minutes until brown but not crisp. Remove the onions from the pan and set aside. 3 In the same frying pan, add the marinated chicken and all of the marinade. Add half of the coriander, half of the mint and half of the fried onions and cook gently on medium heat for 4-6 minutes. Remove from heat, cover the chicken with the cooked rice. Sprinkle the remaining fried onions, coriander and mint over the rice. Add toasted almond flakes if desired. Cover and cook on very low heat for 15-20 minutes. 4 Remove from heat, gently stir the rice through and serve with poppadoms, pickles and chutneys of your choice.